You take your children out for a night of Halloween fun. You spend all night walking your child around the neighborhood allowing them load up on candy. You return home and are exhausted. You turn on the TV and settle down with your kids to finish the Halloween night watching scary movies on TV. Your children dump their candy out and begin chowing down. Suddenly you hear a scream from one of your children and he runs to you, his mouth filled with blood. He is crying with pain. He has a huge gash in his mouth. You begin to examine the candy bar your child was eating and to your horror and disgust you see a razor blade protruding from the chocolate. The majority of the documented cases of the razor blade in the candy can usually be traced to a prank pulled by a teen looking to have fun on Halloween. While I believe stuffing candy with sharp objects is inexcusable, in most cases the full intent to harm another is usually not the motivation in most instances. It is usually done as a playful prank to freak out parents or little brothers, but there are cases that break that mold. In Minneapolis an incident occurred on Halloween of the year 2000. 49-year-old James Joseph Smith was arrested after he put needles inside of snickers bars and then handing them out to children during the Halloween festivities. A 14-year-old boy was pricked with a needle after biting into the bar and other children were also injured, luckily none had to be taken to the hospital. Tommy and Cassidy were a happily married couple and had been married for 25 years. They had two children together all of whom were grown. One rainy day while on his way to work Tommy hydroplaned off the road and crashed into a telephone pole. The crash turned out to be fatal. Cassidy and her two children were distraught by the loss. About a week after Tommy’s death something peculiar began to happen. Cassidy and her two children both began receiving calls on their cell phones from Tommy’s old number. This legend has been used as the plot for many fictional television shows and has been retold countless times, but there is fact to this legend. There are actual supposedly true stories that are similar to this that date back to the early 90s, but the most well documented instance of this urban legend coming to life occurred in 2008. On September 18, 2008 in California’s San Fernando Valley a commuter train collided with a freight train. Andrea Katz heard about the crash on the radio and to her horror realized that her fiancée, Charles Peck, was on the commuter train. For 11 hours after the crash, Peck’s cell phone placed 35 calls to different loved ones. Peck had called his stepmother, his son, his sister, his brother, and his fiancée Andrea. Each time they answered the phone they got static and when they attempted to call him back it went strait to his voicemail. Rescuers used Peck’s cell phone signal to locate him. Charles Peck was drug from the wreckage 12 hours after the crash. It was determined that he had died on impact and yet somehow he had managed to call all of his loved ones. A group of teens are up to some tricking on Halloween. They are throwing toilet paper in the trees of a house, when a particularly gruesome decoration hanging from a tree catches their eye. 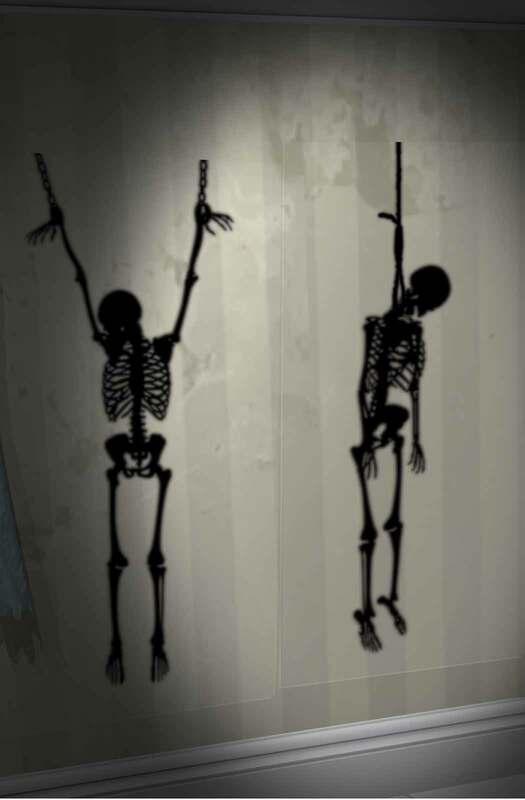 The decoration depicts a hanging man, the teens decide to knock down the decoration and steal it in other to use the macabre décor in some other Halloween shenanigans. The group succeed in knocking down the decoration they go to retrieve their prize only to discover that the fake Halloween decoration is an actual dead body. There are actually several well-documented cases of something similar to this actually happening. On October 26, 2005 the corpse of a 42-year-old women was left hanging from a tree, suspended 15 feet in the air on display to the entire city of Frederica, Delaware. Similarly in October of 2009, the decaying corpse of a 75-year-old suicide victim was left on a patio for three days before someone realized he was not a Halloween decoration. In another similar event, the television crew for the show The Six Million Dollar Man prepared to shoot a scene in the haunted house at the Nu-Pike Amusement Park in Long Beach, California. They were removing a hanging corpse prop when the arm fell off and they saw bones inside it. To their horror, the hanging corpse was a real body. It was discovered that the body was that of the outlaw Elmer McCurdy who had been killed and his body and been sold and resold time and time again before it ended up as an amusement park prop. A vacationing couple stop at a hotel for a night of relaxing. Upon entering their room they are bombarded by an awful odor. They complain to the hotel staff about it, but they say that there is nothing they can do. The couple tries to withstand the smell, but it eventually becomes unbearable. They decide that they themselves will seek out the source of the smell. They trace the odor to the bed. The man lifts the mattress and discoveries a dead body hidden there. This legend is so rooted in fact that there are examples of this actually happening in hotels and motels all across the United States dating from 1982 to now. For example, on July 10, 2003 at the Capri motel in Kansas City a man complained of a foul odor in his room. Management believed the man was over exaggerating the smell and gave him some air freshener. The man withstood the smell for three days before checking out. On July 13, housekeeping discovered a decomposing body under the mattress.